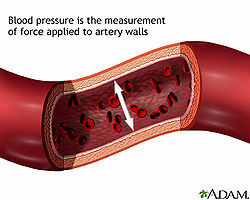 Hypertension , or high blood pressure, is a disorder where the pressure in the arteries is too high. Once it develops, the patient will suffer from it for the rest of their lives. On the bright side, it can be treated. Having high blood pressure puts strain on the heart and the circulatory system. which can continue to damage other parts of the body and ends in death . Hypertension is a disorder characterized by chronically high blood pressure. It must be monitored, treated and controlled by medication, lifestyle changes, or a combination of both. Hypertension is hard to detect because the patient will not show any symptoms. They only way to be certain about the diagnosis is to visit their health care provider. Since there are no visible symptoms of hypertension, many people will start to develop heart disease and kidney problems and not even know it. As many as one-third of those suffering from hypertension are not aware of it. For this reason it's important to have regular checkups; especially if the patient has relatives with high blood pressure. Once a patient's blood pressure has reached a dangerous level, they will have symptoms such as: change in vision, confusion, chest pains, breathing problems, irregular heartbeat, blood in urine, or nosebleeds . This form of blood pressure is called malignant hypertension. There are many factors that can contribute to the increase of blood pressure. Some of these are: the amount of water and salt in the patient's body, the state of the kidneys, blood vessels, or the variations of the levels of hormones in their body. Age can also affect blood pressure. As the patient ages their blood vessels stiffen, which cause the increase in blood pressure. Having hypertension can increase the chance of having a stroke, heart attack, heart failure, kidney disease, or premature death. There are certain patients who have a higher risk of developing hypertension, such as those who smoke, are over weight, consume high amounts of salt,lack physical activity, have diabetes, or have a family history of high blood pressure. The treatment for patients with hypertension is lowering their blood pressure so that it is less than 140/90 (blood pressure reading). It is important to treat hypertension as soon as possible to reduce the risk of strokes, heart attacks, and heart failure. 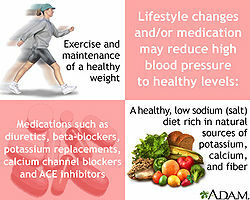 Hypertension can be treated by changing their lifestyle, and taking medicine. Some lifestyle changes include: losing weight, quit smoking, having a well balanced diet, having a more active lifestyle, and reducing consumption of salt and alcohol. There different medicines that can be prescribed to patients to treat their high blood pressure. Some of these drugs are ACE inhibitors, ARB drugs, beta-blockers, diuretics, calcium channel blockers, alpha-blockers, and peripheral vasodilators. These are the most commonly used drugs to treat high blood pressure and they can be used alone or combined. After the patients blood pressure is reduced, it is important to continue to have checkups to prevent it from increasing again. Blood pressure is recorded by using two number as a ratio. It will usually look like this; 140/90. This number reads "140 over 90 millimeters of mercury". The top number is called systolic and the bottom number is called diastolic. The systolic number is the highest of both number and measures the pressure in the arteries when they heart contracts. They diastolic number measures the pressure in the arteries between each contraction of the heart . These lab tests include urinalysis, blood cell count, blood chemistry (potassium, sodium, creatinine, fasting glucose, total cholesterol and HDL cholesterol), and an ECG (electrocardiogram). A health care provider will measure blood pressure using a device called sphygmomanometer. This device will show systolic and diastolic numbers which will be recorded and compared to a chart of values. Anything greater than 140/90 is considered hypertension. Before making a diagnosis, the health care provider will have the patient perform a physical exam. It is also important that the patient informs their doctor if they smoke, have high cholesterol, or diabetes. If the health care provider fears their patient suffers from high blood pressure, they will conduct the following tests: electrocardigram and echocardiogram. These tests measure the electrical activity and show the physical structure of the heart. 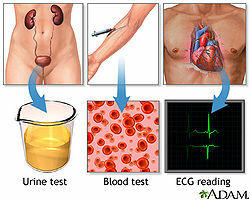 Further tests can be given to measure renal function, electrolyte level, sugar levels, and cholesterol levels. It is difficult to narrow down if a child has normal blood pressure because their ideal number will vary with age. A child is considered to have hypertension if the child's blood pressure is higher than ninety-five percent of children the same age, height, and gender. Like adults, children can develop high blood pressure due to being overweight, not having a balanced diet, and not doing any physical activities. If the child is younger than ten years old, their hypertension could be caused by some medical condition. ↑ Athor unknown. What is hypertension / high blood pressure? Patient Health International. Web. Date-of- access: March 6, 2013 (specify which). ↑ 2.0 2.1 2.2 2.3 AUTHOR UNKNOWN. Hypertension; HBP; Blood pressure - high PubMed Health. Web. Last-update: June 10, 2011. ↑ 3.0 3.1 3.2 3.3 Crosta, Peter . What Is Hypertension? 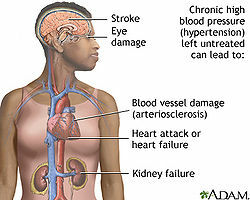 What Causes Hypertension? Medical News Today. Web. Date-of-publication: 15 May 2009. ↑ 4.0 4.1 Author Unknown. Understanding Blood Pressure Readings American Heart Association. Web. Date-of-last-update: 1 March 13. ↑ Mayo Clinic staff. High blood pressure in children Mayo Clinic. Web. Date-of-publication : Dec. 18, 2012.